I know lots of food nerds who read cookbooks for fun. Farmstead Chef is one that might be sitting on the coffee tables and nightstands of those same nerds. John Ivanko and Lisa Kivirist of Browntown, Wisconsin, have made sure that their charming book is full of stories from local farmers who are living their dreams on the land. This is definitely the part of the book that captured my attention. From success stories of local farmers finding their niche to articles about finding inspiration when faced with a CSA box full of daikon radishes, this book radiates with the idea of shared learning and community. Even the recipes have nice, personal introductions explaining why they love them or which farmer contributed to the dish. This connection to the land and farming is definitely the passion driving our authors who operate the Inn Serendipity B&B. The book is filled with testimonies about operating with wind turbines, solar panels and sun ovens. 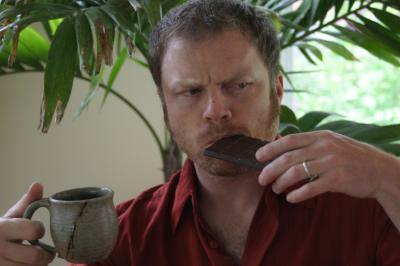 There is definite ingenuity and pride here, but their desire to simplify and be more frugal definitely does not mean that they feel a need to sacrifice quality, flavor or decadence. Again, their idealism and practicality come together in a section called, "Organic Eating on a Dime." "As for the recipes themselves, they pass the "grandmother's test." For starters, most of the recipes fit on one page and have ingredients or names you can pronounce and, usually, could find in your backyard garden or chicken coop. We're all creative, have some degree of green thumbs and can cook in the kitchen. 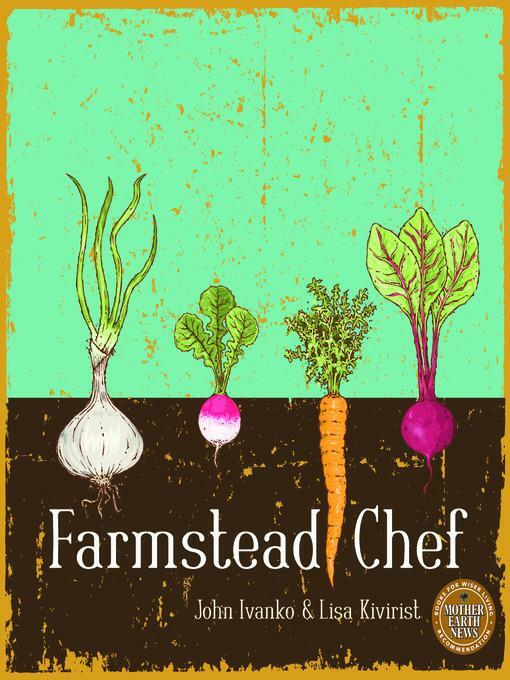 In the case of farmstead cuisine, it's mostly harvesting, washing, chopping, cooking in a pan or oven - not brain surgery." Overall, I find this to be true. The book seems to be one that you can fall back on for solid, well tested recipes like potato pancakes, zucchini bread, beer cheese soup or mac and cheese. However, there are plenty of surprises, such as bacon-wrapped jicama, Latvian pirages, Asian chicken satay with thai peanut sauce, a seafood gumbo and a small section on fermented foods. The more I looked into this book, the more I found. I must have flipped through it ten times before I noticed the miscellaneous section in the back concerning pantry stockings, where you find not just recipes for crayons, playdough, graham crackers and sweetened condensed milk, but an actual checklist of things to stock your pantry as well. It is this mix of creative and practical that makes this cookbook a resource for cooks of all levels, whether you are working on a six burner gas stove or an old fashioned wood burning stove. Finally, I will say that this is one of those books that you can count on for inspiration. More than for exacting recipes, I count on cookbooks to help me find a direction when menu planning. The other day, I was uncertain of what to make for the evening's dinner and for no other reason than that it sounded delicious, I decided to give the Maple syrup marinated wild salmon a shot. I guarantee though, that I am going to try the Walnut burgers or the Beet burgers very soon. I love a strange burger mix! Combine all of the above. 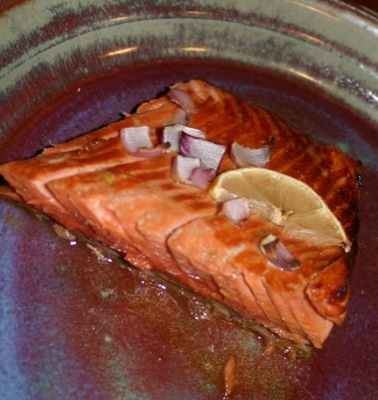 Place salmon in a glass pie plate or bowl with the skin side up. Pour marinade over the salmon and place in the fridge for about 8 hours. 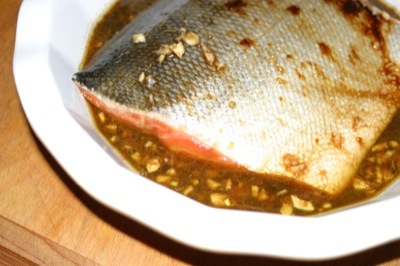 Place a little marinade and then the salmon on a foil lined jelly roll pan or in a glass pie plate. Add the lemon and onion slices atop, if desired, and pour a little more marinade (about 1/2 c) over the fish. Broil at 450 for about 15 minutes. Watch carefully to not overcook and baste occasionally. This recipe also works well if grilling. Enjoy! As always, it is hard for me to follow a recipe, because I either am out of something or just too stubborn. Since the recipe is called maple syrup marinated wild salmon, I skipped the sugar and added more maple. A good choice if you ask me. I also am not one to have bourbon on hand, but I did have amaretto still hanging around from when I made tiramisu years ago. This nutty liquor was perfect with salmon. Finally, I added twice as much garlic and had to use powdered ginger. In the end, it was still delicious, if not more so. I also must admit that I have never broiled fish before. I always fried, poached or grilled it and was excited to try a new method. I thought 15 minutes might be too much, but I actually left the fish in for 20 minutes. It turned out delicious, moist, slightly caramelized, sweet and savory. My whole family loved this dish. I served it with brown rice and a salad loaded with avocado, walnuts and blue cheese. Pick up your sustainably caught salmon from these sources: Clancy's Meat and Fish, Linden Hills Coop, Wedge Coop, Coastal Seafoods, or find out where our friend Matt, of Wild Run Salmon, and his boat the Blue Ox are currently residing. Congrats to Mel, winner of the cookbook! Enjoy and let us know what you are cooking.